I by chance have stumbled on to one that may fit the bill. The owner said it is 26' long double axled with new tires and bearings, supporting system consists of adjustable arms with rollercoaster's. he said he used it to transport a 26' Helms swing keel sailboat... he must have meant a 25' Helms, a 26' Helms I thank was not made. Even still it is very similar to the Chrysler 26', I am hoping one foot + or - does not compromise matters. My question, has anyone dealt with this type of supporting system... adjustable arms with rollercoasters? I only wish that I had that problem,I cant seem to find a used trailer anywhere close to me! As to your question i dont think a foot difference would really make a big difference, I once borrowed a trailer that was set up for an O Day 25 and had no problems.I would at least make sure the trailer is rated for at least 5,000 pounds but 6 or 7k would be better. You need twin axles and 8,000 lbs and it has to sit on its keel and be set-up to be supported by pads at the bulkheads or stringers. there are VERY impt.issues re: toungue weight and I saw some great diagrams and calculations for this on the internet. also, the entire rig from the pavement to the highest point should not exceed 13 feet; also the BEST way to trailer a sailboat, hands down is with a cradle (saddle) set-up, the only maker that does this is TRIAD as they do for the J-24, apparently these saddles are very hard to make in steel and since I still have the OEM shipping cradle that very snugggly cradles my hull, I was told to trace or copy the OEM saddles to be remade into steel for a trailer set-up. One of my trailers has cradle style support for my C22. Each support is on a pivotting mount. On top of each pad is a mounted closed cell foam protector for the hull. The only reason I mention this is that I rarely get the boat on EXACTLY the same way every time. The "pivoting" pads make it very easy to get the boat on. The pads always go every direction until I back the trailer into the water. Then the closed cell foam floats causing each pad to float straght up! Perfect position to slip a boat onto! As I pull the trailer and boat out, the boat settles onto the trailer and the rocking supports adjust themselves to the hull! The draw back is you must float the boat over the trailer.You can not slide the boat up onto the trailer similar to most boats. Because of this, the trailer has a 10 foot extension! I can back it down and completely submerge it at float the boat over it. Just thought I'd toss that in at ya! I have spent more time working on my trailer, than on the boat itself. My C26 came with a three axel trailer that was not properly designed for it. Rather than just "making it work", I thought it would be nice to redesign the whole thing. You can see in the picks how far I got in about 10 months. Now, I have never owned a sailboat, and have only launched one once about 20 years ago. So I am no expert on trailer design. But I do have a local harbor that has over thirty sailboats on trailers as reference. I am amazed the diversity. 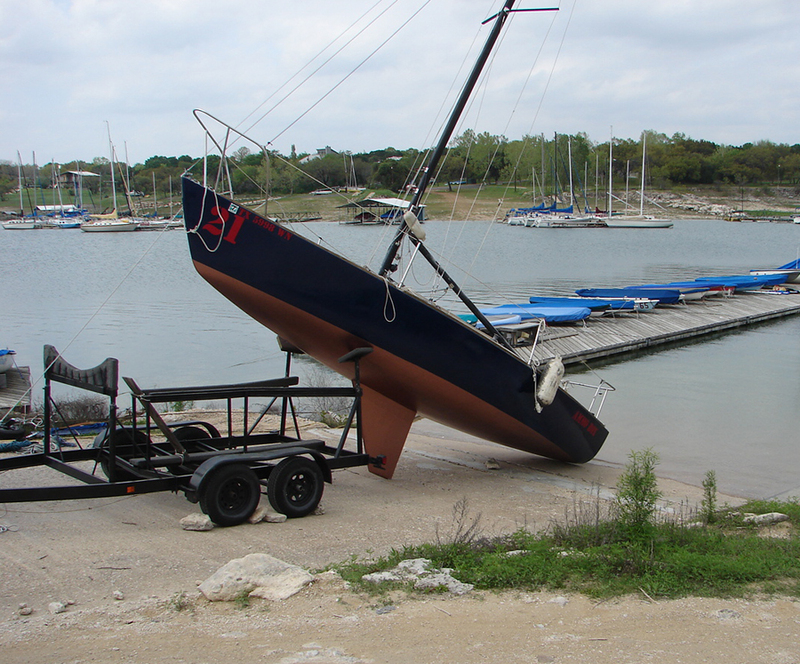 There is an important thing to note in designing a trailer for a sailboat, most of the weight is in the keel. So the side bunks, or cradles, main function is to keep the boat from tipping over when going around corners, and should NOT support the weight of the boat. My boat had sat for ten years with most of it's weight on the side bunks, and they indented the hull! Fortunately, since I have had the weight off of those bunks, the hull has miraculously popped back out. My current project is setting up some keel guides to make sure that it lines up properly, as the keel bunk has a pocket for swing keel and I want to make sure it lines up between those 4x4s. Thanks for the information keep it coming, useable used trailers for the Chrysler 26' seems to be a hot topic. Sailbob the trailer I am looking at does indeed sound like you EZ type. If it is no troubler e-mail me a photo of you Chrysler 26' on the trailer. ( glidern2954c@excite.com ) I will be checking it out in person in a couple of days, if the twin axels measure up to 8000 lbs or real close, I am sure I will be bringing it home. Keep looking njerrell there out there. I found this one in @ three weeks, I hope it is not to good to be true. My next trick will be finding a Chrysler 26' to go on top of it. 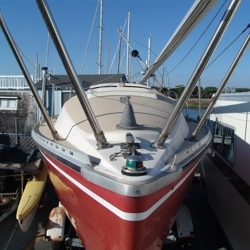 Anyone know what depth of water I would need at a ramp to float off a fixed keel c-26?